TIPTON, IA—Following Gov. Scott Walker’s recent endorsement of building a fence along the Canadian border, Sen. Ted Cruz (R-TX) reportedly worried Monday that all the good foreign countries to wall off from the U.S. had already been taken by other GOP candidates. “Sheesh, the rest of the guys snatched up the best countries right away and now all that’s left to barricade ourselves off from are a few crummy islands,” said Cruz, who appeared visibly distressed upon realizing that, in order to gain attention on the issue of immigration, he was now stuck with backing a plan to build a U.S. border wall in the middle of the Caribbean Sea to keep out undocumented Bahamian citizens. “Boy, I should have jumped on a better option when I still had the chance—it’s down to slim pickings now. Hmm, maybe I can say it would be in the best interests of Americans to build a steel barrier across the Bering Strait to prevent Russian criminals from entering Alaska. 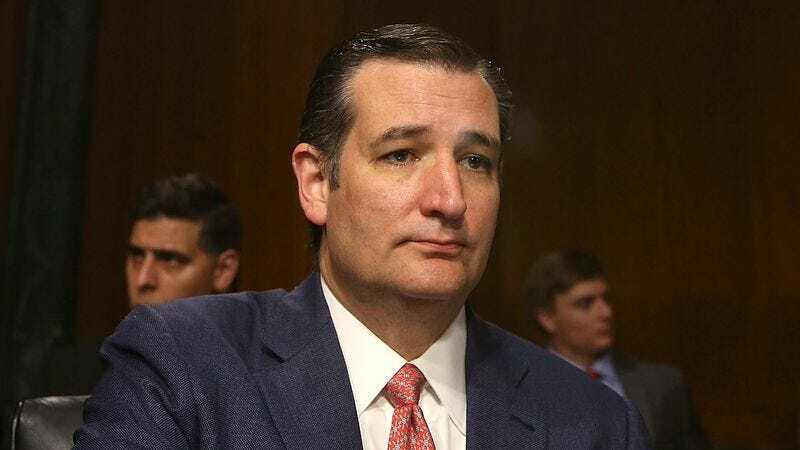 That doesn’t sound so bad.”At press time, sources confirmed that Cruz reassured himself that there were still plenty of decent options among minority groups that he could tear into for causing all of the nation’s woes.